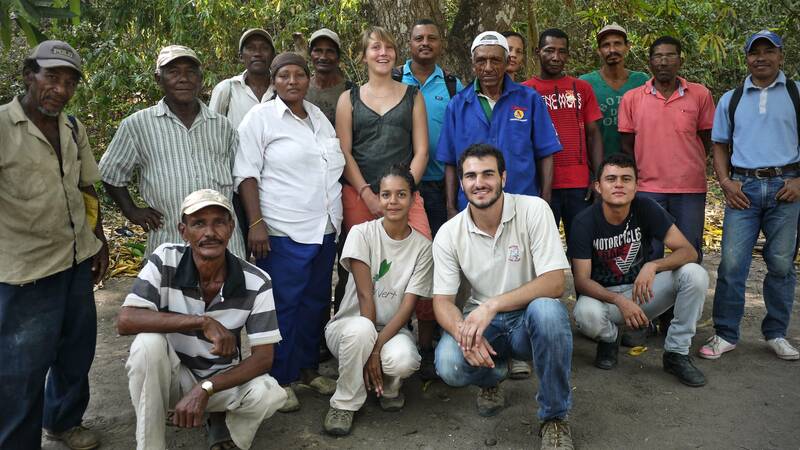 In April, the ASsOciation de CAmpesinos de los LIMites – ASOCALIM – was visited by the well known global firm L’Oréal. Members of the local government (Atlantico department in North Colombia) and Envol Vert were present to welcome them and offer each visitor a gift made by a local craftsman. Our guests enjoyed their visit. 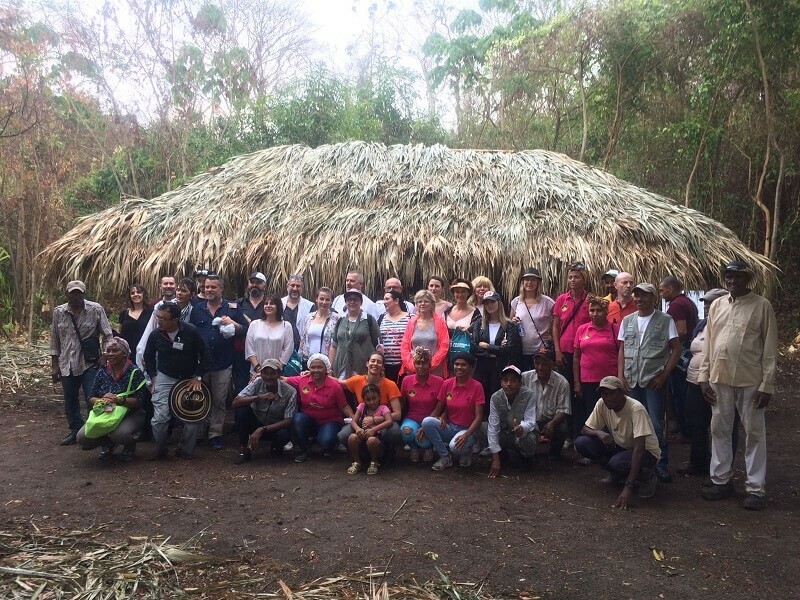 After enjoying a lunch held at the new ranch and showcasing regional cuisine they participated in multiple agrotourism activities, chatted with farmers, attended a lecture on the Maya Nut tree (a tree with near magical properties) and rambled through the dry tropical forest. They were particularly interested by the home-made jams produced by the women of the ASOCALIM community and the traditional craftwork displayed during the lunch. 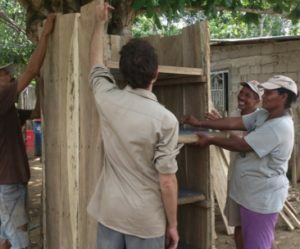 To ensure tourist facilities are available; the farmers, together with financial support from the Atlantico administration, have built dry composting toilets. The waste from these toilets is re-used to make organic compost which can be used on the plots of land devoted to agroforestry. To continue developing and improving the quality of visits, ASOCALIM is participating in two courses focusing on tourism development. The course objectives are to improve the design of the tourism offering, to strengthen the community’s ability to host tourists and to enable them to develop a tourism strategy. As summer and its lack of water approaches we’ve been making use of the last rains working together planting Guaimaro trees on the least planted plots of land, plots which previously suffered from heavy rains and flooding. It’s worth noting this activity involves the families, bringing them closer together, particularly the young and the women whose involvement bears witness to the daily efforts of the farmers. To pave the way for 2018 and ensure a smart start to the two years of project work financed by the agency l’Agence de Micro Projet, an analysis of the last three years and future forecasts was carried out in the presence of the foundation’s president. 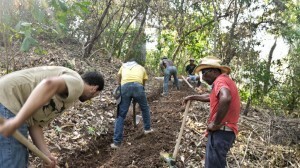 The main conclusions were that working together in an organized manner, improving agricultural techniques and demonstrating a greater respect for the environment had all been learned by those involved. Also noted was a sense of individual fulfillment and their efforts being recognized at both a local and international level. 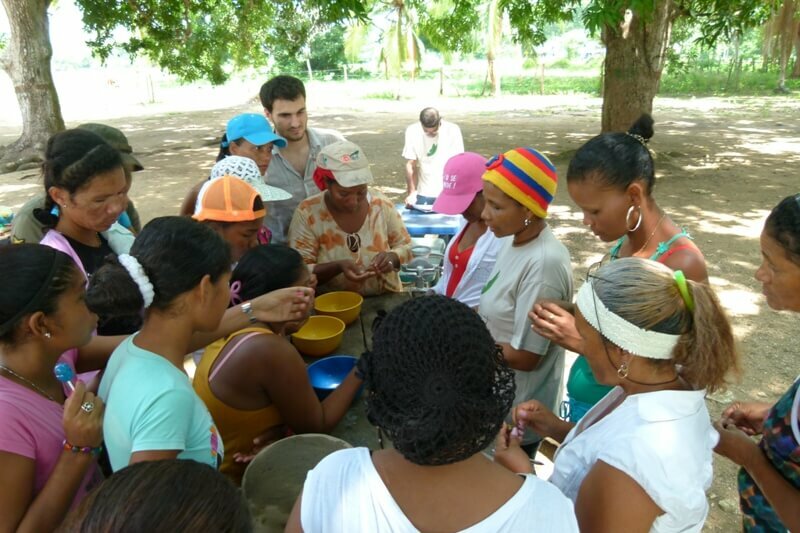 The main challenges for the years ahead were also identified, namely: integrating women and youth in the project, continuing to support the processing and sale of products and the organizing of some seed capital to increase production. 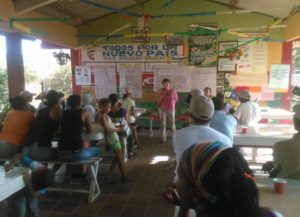 Farmers together with women and youth from the Los Limites community began a training session about seeds, run by SENA – a Colombian educational organisation. The training aims to develop the agricultural knowledge of the farmers and some of the women whereas for the youth it’s a first glimpse of the world of agriculture. As part of the training, all participants were given seeds, organic compost and a planting tray. All the materials were used for sowing a range of produce such as watermelon, cucumber, coriander and tomatoes. All present hoped for a successful germination so the seedlings can be transplanted to the farmer’s growing area and for a subsequent harvest in 2 or 3 months time. ASOCALIM took part in Bioexpo Caribe 2017, the country’s largest trade fair focusing on goods and services related to sustainability and ecosystem conservation. The Gouvernorat d’Atlantico fully supported this initiative by presenting, promoting and selling ASOCALIM products, including the infamous jams and also organic compost sold by the kilo. 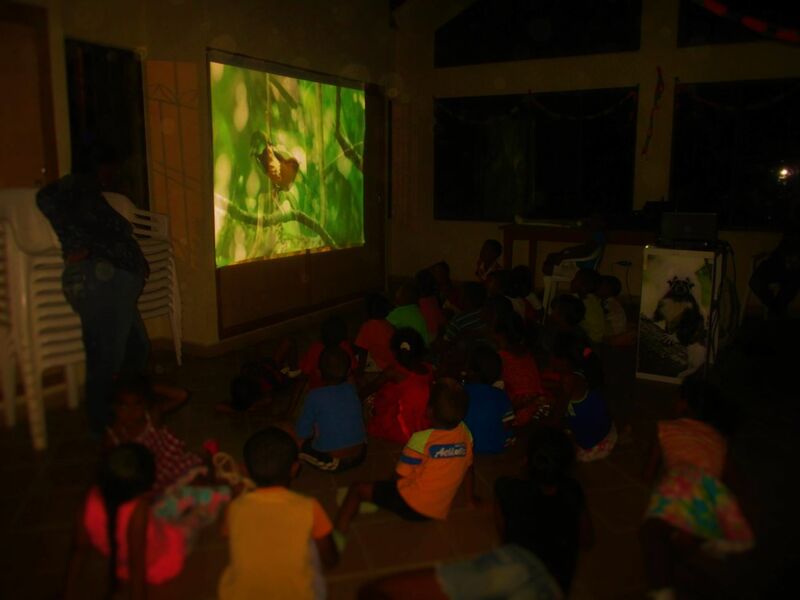 Lastly, the 12th October saw the national TV broadcast, on the Caracol channel, of a short film showing the work of ASOCALIM and the Los Limites community to protect the habitat of the white-headed Titi monkey. Check out the video here. 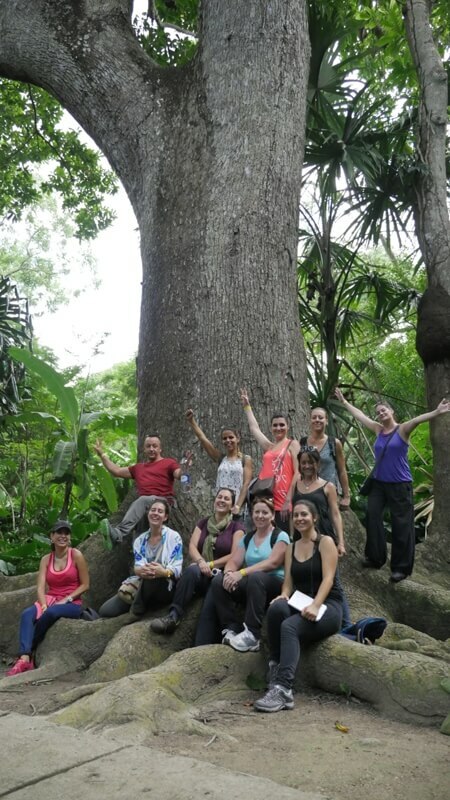 Twelve lucky staff members of Maison du Monde came to discover the Maya walnut tree project and sustainable farming on the occasion of a solidarity leave they are sure to remember. From September 10th to 18th this French visitors came to the municipality of Los Limites to share intense moments of joy with their hosts, during several activities related to the project of dry forest preservation. The visit of the plots introduced the week, providing to the group a first contact with the farmers, along with the chance to get familiar with the agroforestry system implemented for the organic production of a variety of fruits and vegetables, and plants with medicinal virtues used by the community. 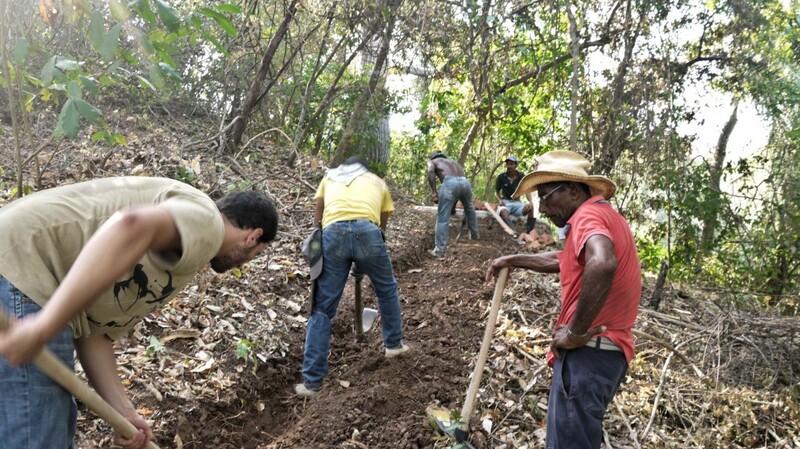 The participation of the visitors increased as they helped to plant more than 200 trees on the project area, thus contributing to the reforestation by native species of the tropical dry forest, such as the Maya walnut tree. 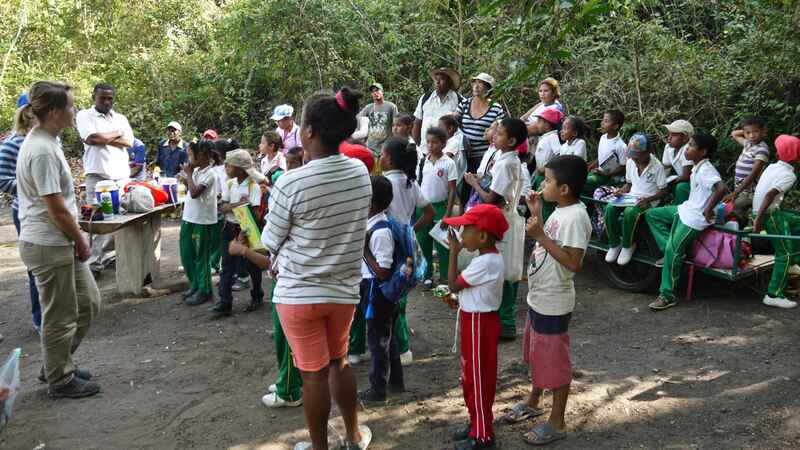 The guided tour of Ceibal reserve offered to the Frenchs an enchanting discovery of the very specific ecosystem of the tropical dry forest, and of its iconic representative: the white-headed Titi monkey. This ecosystem is today extremely weakened, as were able to notice the group during their way through the deforested areas of Ceibal farm, thus giving its full meaning to the project led by Envol Vert. This week awoke strong feelings among everyone and lingered in the memories unforgettable souvenirs, and very strong exchanges with children. The community of Los Limites can be proud to offer to foreign visitors the best of the Colombian Caribbean coastline. But this trip wouldn’t have been complete without a guided touristic visit of Cartagena, of the botanic garden and of the National Park of the Rosario Islands. They were filled with the emotional feelings of joy and happiness as the left. Good news! The ASOCALIM will soon be able to offer new products for sale thanks to the solar dryer that association’s members built. Dehydrated mango, papaya or pineapple will be available on the store shelves! The members will also be offered to use this tool to dry harvested seeds so to re-sow them in the plots! Everyone is eager to carry out the first processing tests! Moreover, project beneficiaries, men and women, did join a training on communication led by Lucy Ramirez from Biocomercio Sostenible. This training will allow them to discuss together in the most clear and respectful way, and so not to fall into the trap of misunderstandings and hearsays which may circulate within the association and to a broader extent within the community. As a conclusion, the beneficiaries did agree in concluding their own ideas and in never forgetting that unity is strength. 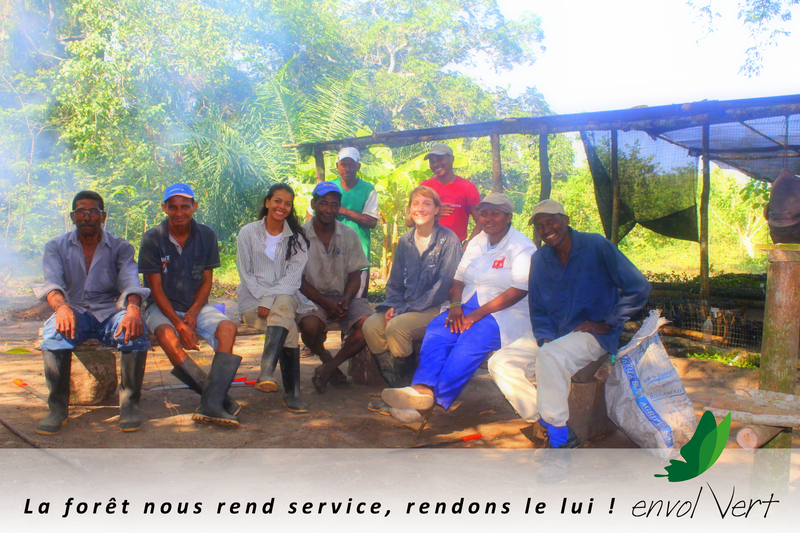 Lastly, we are pleased to welcome our new volunteers for this coming semester: Mathilde Lagesse et Angélica Reyes ! 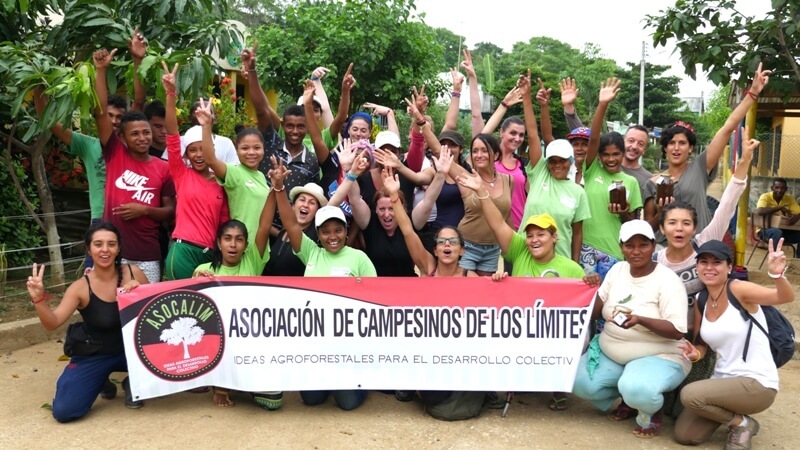 After two months of dealing back and forth with the Colombian authorities and institutions, we have been granted the legalization of the workers group: Asocalim (Asociacion de los campecinos de los limites)! We have now done all the necessary paperwork, and have a bank account, which enables us to continue to strengthen and facilitate new and existing partnerships. Earlier this month we finished the environmental evaluation of the project, which will allow us to discover the great diversity of fauna that lives or borders up to this this zone. We found the Aras parrot and other birds of prey flying around the treetops, many different insects and as always a lot of monkeys (titis, howlers and capuchins among others) We are very grateful to Diana for her help and support during these last intense weeks. We also want to share the news of our two new beneficiaries of the project, who will replace the previous ones. 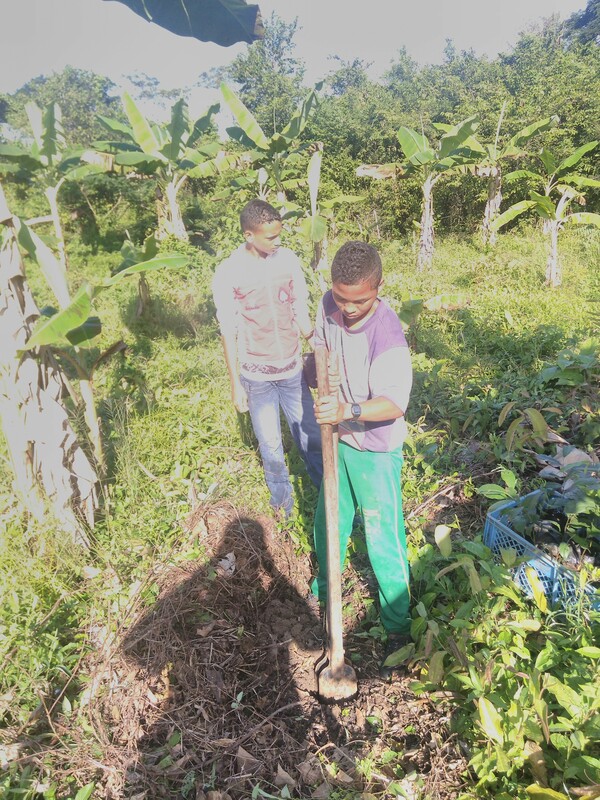 Mr. Ramiro and Mr. Wilmer are very motivated to become part of this new sustainable agricultural project, which they have heard so much about through the workers’ group ACOSALIM. The two gentlemen are excited to begin the adventure of planting trees in their agroforestry land plots! Welcome to both of them. At the beginning of the month, Daisy Tarrier paid us a visit to in order to finalize the methodology of the social and environmental evaluation of the Envol Vert projects. The social part will be analyzed through questionnaires with the beneficiaries in November. These questionnaires will be a follow up to the interviews conducted with them last year. The environmental analysis has already been instigated by Diana Reina, who is a volunteer biologist, and who will help us for three weeks to finalize the project. With this evaluation we hope to gain some interesting insights about the impact of the project so far. We will measure the impacts by: the diversity of fauna and flora, the quality of soil and lastly the state and growth of the trees. Regarding other subjects, we will continue to work with the women of the Asocalim association, after having strengthened their activities and skills: the jams are already being sold in different places and the women of the Asocalim will join the festival in Luruaco. 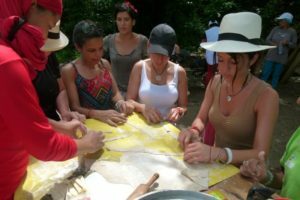 In light of this we have organized a training workshop about traditional medicine, which will teach them to make: soap and balms out of their own plant harvest or from plants in the reserve! We have entered the rain season this year, and it has been raining almost every day, which luckily makes the farmers very happy! The landscape has changed radically, going from yellow and dry to luscious green, with a multitude of plants growing in all directions. 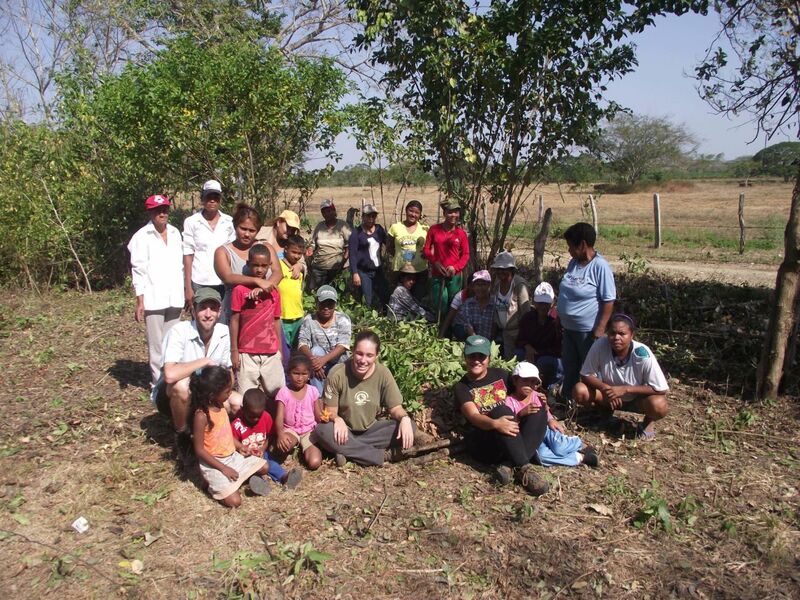 In the land plots, we find that the trees and cultures are growing in harmony, despite the diversity of species: fruit trees, manioc, corn, beens, watermelon, zucchinis..and of course Guaimaros! The last mentioned are growing a lot these days – several centimeters a week! We hope to have the first harvest ready in July! 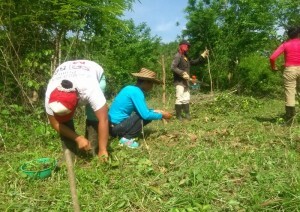 We have also taken advantage of the rain season by recommencing the land plot of “las mujeres” (the women) after nearly two years of drought. We have organized a communal session of seed-distribution, in hope of providing an alternative financing method for these women of the town. 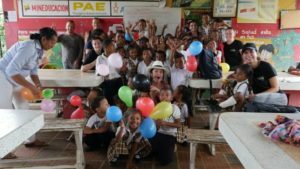 To see this project be realized with an incredible collective will and a positive attitude has impressed David Solon, a journalist from Terra Eco and mediator at the international festival Colombodiversidad, which is organized each year by Envol Vert. On a final note, the women of Asocalim are highly motivated about the jam production and have begun to sell them on the roads of the village.. and with great success! Strengthening Acosalim and promoting their products! At the beginning of this month we were paid a visit from two teachers from the association Biocomercio Sostenible for two days of exchanging experiences on production processes, and comparing costs (of compost and of the jams) Most of all we discussed the process and daily management of Acosalim. We are also, in line with this visit, proud to announce that we are now ready to sell our organic compost of high quality! We already have some orders – and we are very pleased that the organic jam sale is going so well! During our last trip to Cartagena, we also found different retailers who will be willing to sell our products in the organic supermarkets! The on ground visit from Daisy Tarrier, the president of Envol Vert, formed the occasion to kick-off and launch the group of 14 beneficiaries and Liris, the leader of Los Limites, who now constitute the 15 members of the ACOSALIM association. The day of the launch went well, and everyone was in high spirits. The morning was dedicated to a discussion of the overall goals, statutes, and the managerial organization of the association. At the end of the day, the general council was elected and the logo was chosen. Due to the drought in the region, which has lasted for months, farmers have not been able to harvest any crops. Alternative sales opportunities were therefore discussed: processes of making mango jam, dried mangoes, selling organic compost, olfeira seeds. 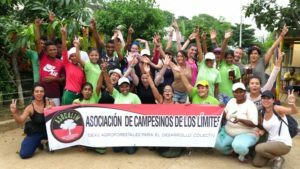 The association will soon launch a group for the women of “Los Limites”. These women are already involved in the work with permaculture, and many of them already show an interest in Acosalim. The launch of this new project coincides with the arrival of two new volunteers, and we wish them a fruitful experience during this rain season! To mark World Environment Day on 5 June, we welcomed 16 children aged 1 to 3 years from the creche for the villages of Los Limites and Pendales, along with some of their mothers. The day was a chance for discussion and awareness-raising on environmental protection and for the planting of Noya Maya seedlings, after 7 months in the tree nursery, on the plot of one of the project beneficiaries. Each child planted and now sponsors a tree in the project zone. 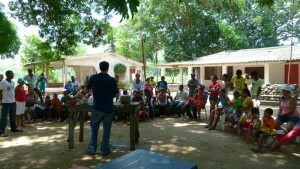 The activity was a great success, both with the children and the parents present. They all went away enthusiastic and better informed about the impact of deforestation and the importance of protecting the environment. Training on how to prepare and cook the Noya Maya was organised with the Los Limites community on 13 and 14 June. 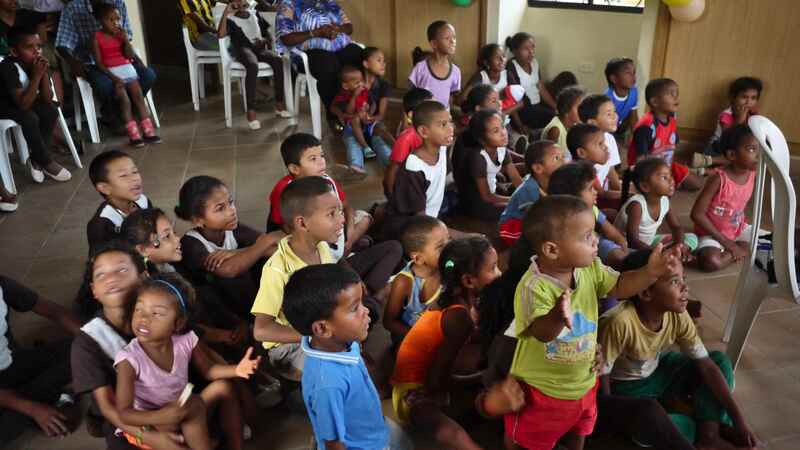 Darys Cabarcas, who works to promote the Noya Maya, came from the Guajira region to lead the training session attended by 55 adults from the village and a lot of their children. They learned how to dry and roast the seeds and discovered various recipes using dried or fresh Noya Maya seeds. The session ended with a meal and the chance to taste the 6 recipes looked at during the workshop. A diploma was also awarded by Envol Vert. To ensure proper development of crops and trees during the dry season in the region, an irrigation system has been installed. This comprises a 6-ton (6,000 litres) water tank, a pump and a network of pipes stretching a total of 1 km. The water is captured from an artificial lagoon known as “La Argentina”. Work began in March 2015 and was completed for the inauguration on 23rd May. The event, attended by all the farmers benefiting from the project and the property administrator, also included lunch and an official photo to mark the day. This work, done and coordinated by Envol Vert, will benefit the 13 farmers involved in the project by channelling water straight to their plots. 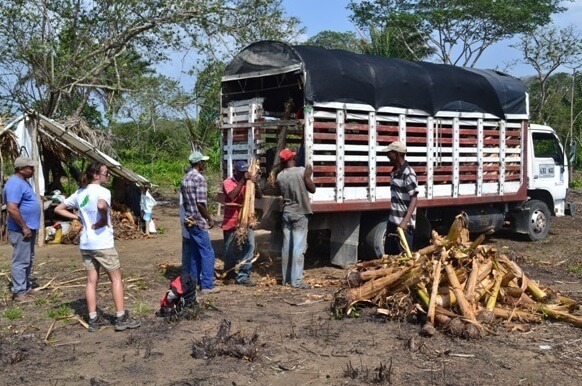 650 banana plants were bought from local producers. These plants are particularly drought-resistant and grow quickly. 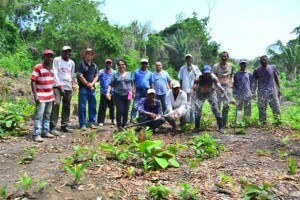 The plants were shared out fairly between the 13 farmers involved in the project and planted 5 metres apart, offset in parallel rows, awaiting the Noya Maya (Guaimaro) to provide shade. 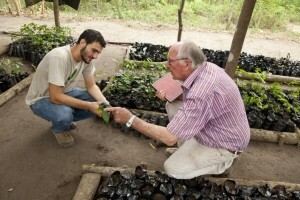 It was a great pleasure for Envol Vert, Finca El Ceibal and the farmers benefiting from the project to welcome professor of botany Francis Hallé, accompanied by Envol Vert’s president, on the 13, 14 and 15 May this year. 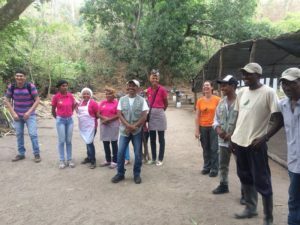 Over these three days, the farmers themselves presented the project at a meeting at the tree nursery and then shared a delicious Sanchocho stew. They expressed their delight with the progress and work done together, but also evoked certain difficulties. During the visit of the nursery and the plots to be planted as part of the agro-forestry scheme, Francis Hallé offered some sound advice for greater efficiency (faster growth) and less disease (fungi). There was also a visit of the botanical garden and its reserved area where we saw a number of mature Brossimum Alicastrum (Noya Maya) trees and again Francis Hallé shared his advice for taking cuttings. There were also some lively discussions with the project’s farmers, who are just as passionate about the tree as the professor! 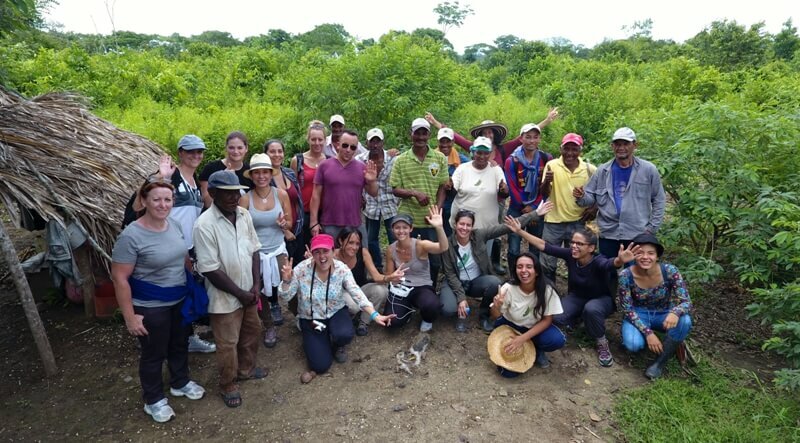 We also took the opportunity to visit an agro-ecology project that aims to protect the Caribbean landscape that is forming nearby. This area is particularly subject to erosion. We discovered a number of interesting opportunities for exchanging ideas between projects. Watch this space! Fresh blood among the volunteers! 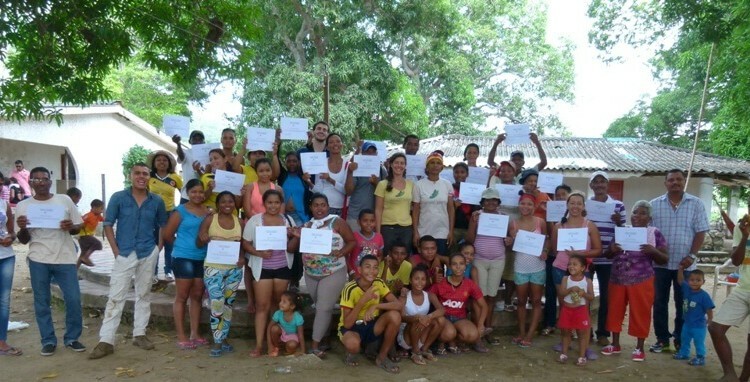 After six months spent working with local stakeholders to ensure that the project is running smoothly, Maria and Magali have handed over to two new volunteers. After a transition period during which they were able to get to know the different parties involved and immerse themselves in the project, it is now Holman and Théo’s turn to coordinate things. 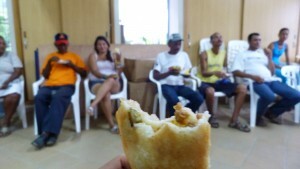 Holman, a Colombian living in Barranquilla, has studied biology while Théo (French) is an agronomics student. They’ll be working on the project until the end of August. The construction of the irrigation system began in March. 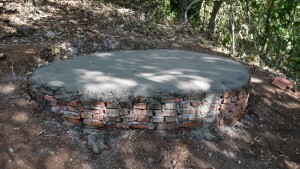 The farmers worked together to build the cement platform that will serve as a base for the 6,000-litre tank used to store the water required for crop irrigation. A kilometre-long trench was also dug to bury the irrigation pipes that will carry water to the plots of each farmer involved in the project. The water needed to irrigate the plots will be drawn from the “La Argetina” lagoon which spans 6.3 hectares and provides a permanent water resource, even during severe droughts. In addition, a small depression covering 0.1 ha, just next to the lagoon, fills with water during the rainy system. 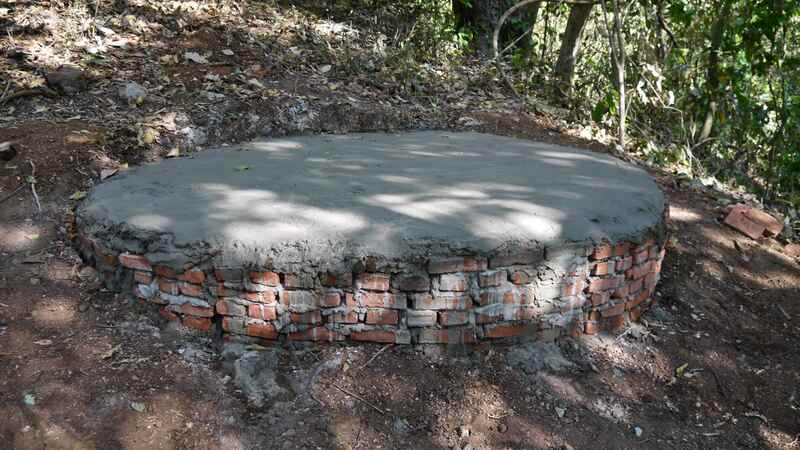 A “trapdoor” system has been built so that the La Argentina lagoon can be filled from this secondary water source, to maximise the quantity of water available for irrigation and the local ecosystem. 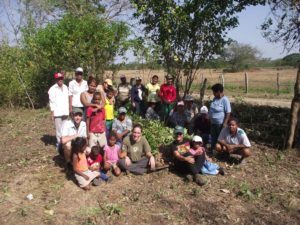 The project’s objective is not only to help the farmers involved but also to have an impact on the entire Los Limites community. As such, there have been several activities involving the village school. Around fifty children took part in a day of awareness raising at the project’s tree nursery. 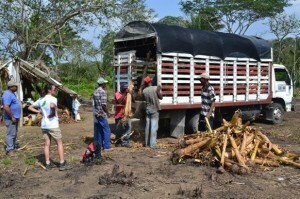 The project’s thirteen farmers and ten or so adults from the village were also present. The day was an opportunity for Envol Vert volunteers to provide more detailed explanations on the project’s goals, to give a guided tour of the nursery and talk about the trees found there, while raising the children’s awareness as to the importance of biodiversity and the tropical forest. Everyone then took part in a series of activities at the nursery, including preparation of the drip irrigation system for more than 600 trees. The drip system was made using old plastic bottles collected by the Proyecto Titi foundation, a project partner. These bottles will be used during the initial Noya Maya tree planting phase, to optimise irrigation and the trees’ chances of survival after planting. To mark Magali’s departure, a video screening was organised in the village craft centre. 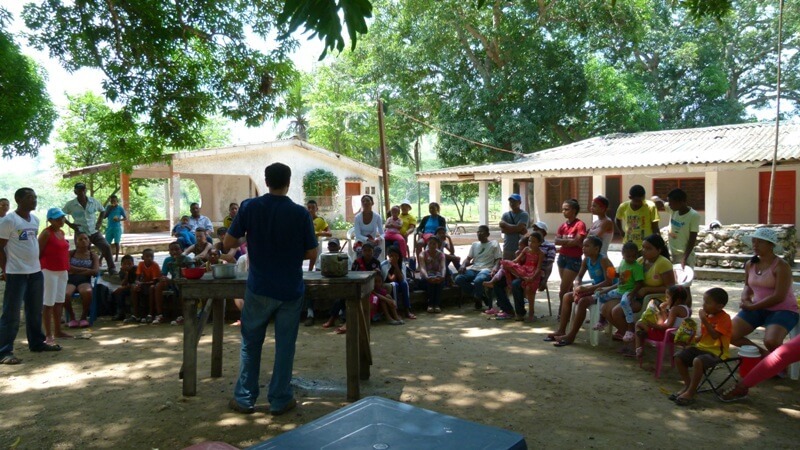 This was a chance for the volunteers to recall the results attained over the first six months of the project. 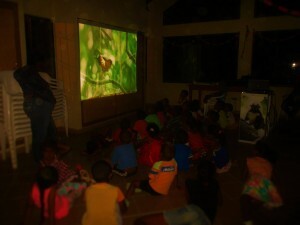 The 54 children and 20 adults present then watched an environment-themed cartoon. The farmers are gradually adopting the concepts of sustainable agriculture, getting their seeds straight from the fruit instead of buying them, and using organic pesticides. 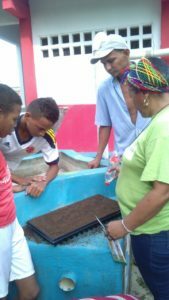 One participant, Victor Olivares, who has extensive knowledge of medicinal plants, uses a blend of chilli pepper, garlic and nettles for fumigation of his crops. This mixture repels the insects that eat the leaves, prevents diseases and also strengthens the plant roots. Now, thanks to Victor’s knowledge, disease is controlled organically at the nurseries, with no impact on people or the environment. Summer has made a powerful return to the Atlantic coast. High temperatures (38°C) and a lack of water in the area make vegetable growing almost impossible. However, project participants are managing to keep plants wet and cool and achieving some good results. The nursery doesn’t only nurture the Noya Maya but also fruit trees that are native to the region and that can be legitimately included in an agro-forestry system. 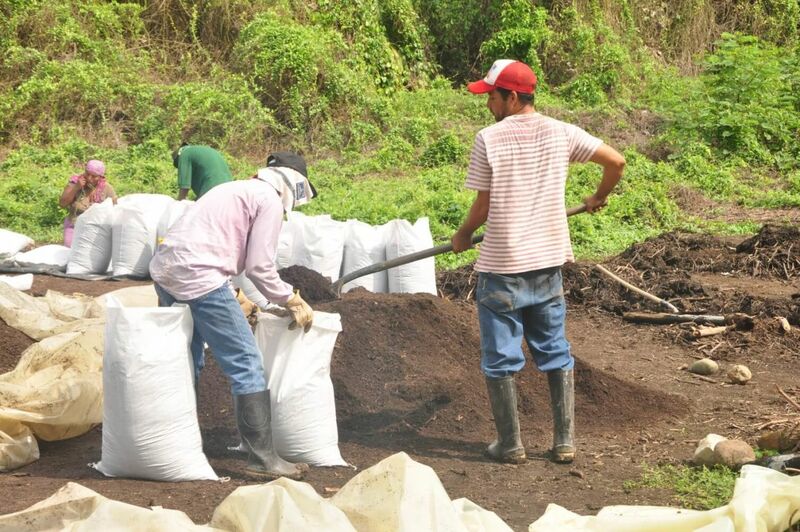 Mango, papaya, soursop, oak, rain tree, gliricidia and quenepa are just some of the plants brought by local farmers. They also sow passion fruit, guava, medlar, starfruit, lemon, annona and papaya. The farmers harvest the fruits, collect the seeds, wash them, dry them and then sow them, hoping that the plants obtained can be transplanted into the grow-bags in the following months. One of the first phases of the agro-forestry system has begun with the construction of a tree nursery located near the project farmers’ plots. 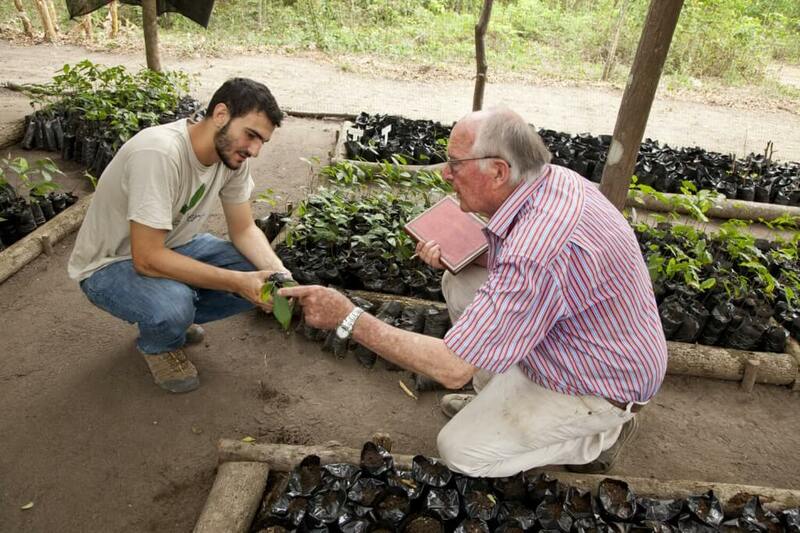 Farmers at Los Limites are currently taking care of more than 1,500 plants and Noya Maya seedlings. During project meetings between Envol Vert and farmers at Los Limites, the first Noya Maya nuts were cooked and tasted in a variety of forms: areapas, coffee, empanadas and so on! A wonderful chance to discover the rich culinary potential of this highly nutritious nut. 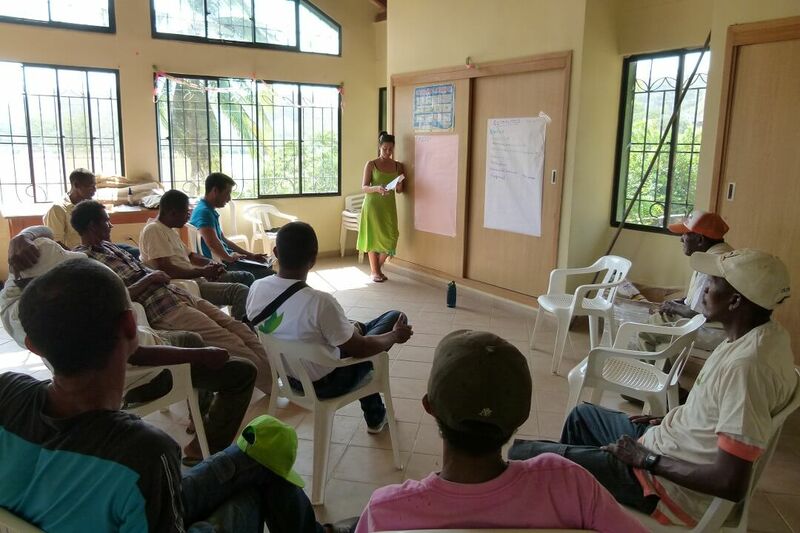 Three farmers, who will in turn train their peers, took part in a week-long training session on reforestation systems and food safety at the Escuela de la Naturaleza in Rio Ancho (La Guarija) with the Nativa foundation, with whom Envol Vert has worked on the Noya Maya in the past. Then, in Palomino (La Guajira), the farmers had the chance to discover the reforestation project run by the Union Salva Bosque and Envol Vert. Both these initiatives place the Noya Maya at the heart of the project, as this species is important for human consumption and for wildlife. In order to find out if it is possible to reproduce the Noya Maya and, above all, guarantee development of the main root, different reproduction experiments have been carried out: transplantation, sowing and cutting (in water and in soil), with and without rooting hormone. After three weeks, the cuttings in water did not show any sign of growth, as the branch was too damp. None of them survived. Among the cuttings placed in soil, only those with a diameter exceeding 10 mm and without the hormone showed signs of new branch growth, although no root is visible for the moment. Further experiments are underway to find out whether this kind of reproduction can really be envisaged. The seeds germinated after around two weeks. Out of 200 seeds sown in the seedbed, only 37 germinated and were transplated to the nursery. 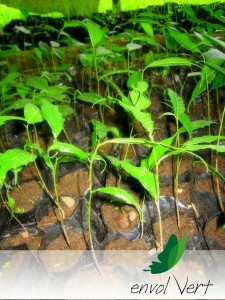 Reproduction through transplantation works well when the plants are placed in the nursery. All these experiments are being continued to obtain more practical knowledge of the Noya Maya. 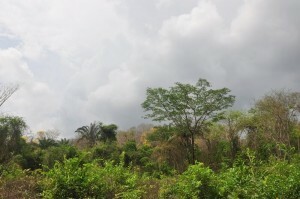 Biologist Irina Mendo, supported by the community, has identified the Noya Maya trees that could be reproduced, demonstrating that this species is still present in the dry tropical forest ecosystem on the Atlantic coast and has adapted to the area’s climatic conditions. Following a more intense summer than usual in 2014, mainly due to El Niño and climate disturbances affecting the Colombian Atlantic coast this year, it has been very difficult to find Noya Maya seeds within the project zone. 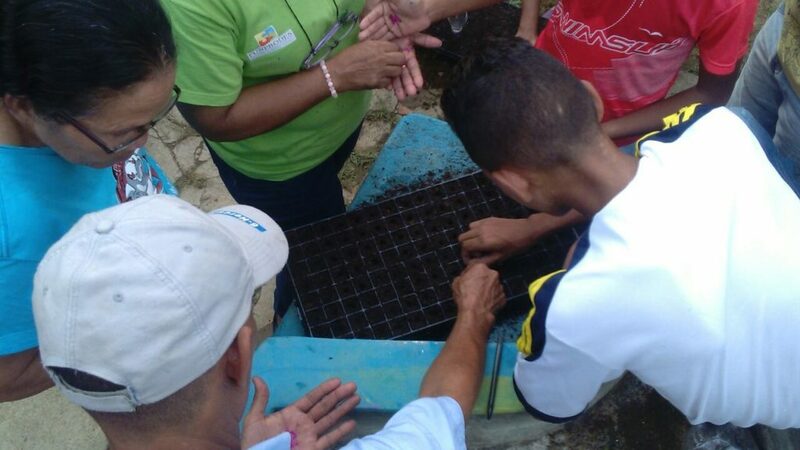 However, Noya Maya seeds have been donated by the Los Besotes eco-park, located 10 km from the town of Valledupar (Le César) and which makes a generous contribution to the conservation of the species. Other seeds were obtained from the other Envol Vert project in Colombia, with help from the Union Savabosque in Palomino. During the dry period, it is impossible for farmers in Los Limites to continue to farm their plots because the streams that form during the rainy season soon dry up. Water, used for the families’ daily consumption, is purchased from neighbouring farms and proves to be costly yet insufficient to cover all the village’s needs. 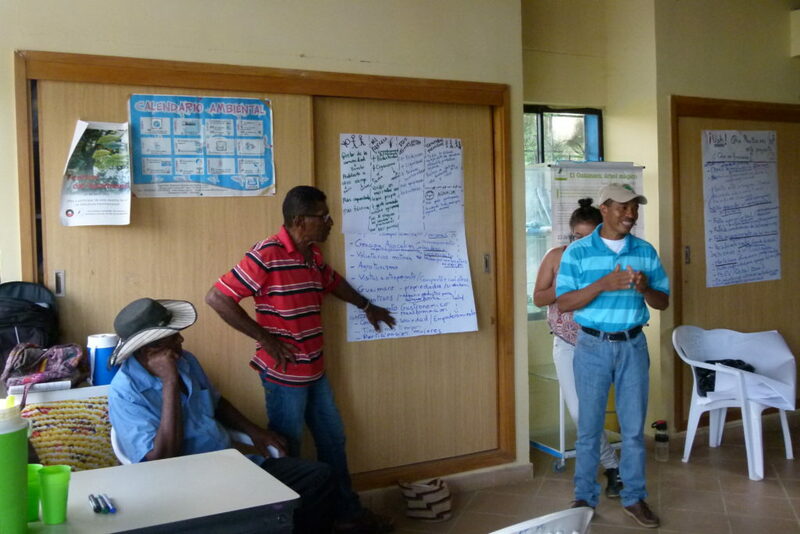 With support from Envol Vert, the farmers are now considering different options to build a sustainable irrigation system. It will then be possible to plant trees and agricultural crops to feed the community throughout the year. 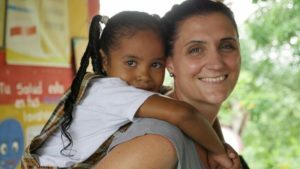 Two volunteers have arrived to work with the farmers from the Los Limites community to set up the Noya Maya and sustainable ranching project. The goal is to support them and guide them through the different stages of the project, taking their needs and their views into account. 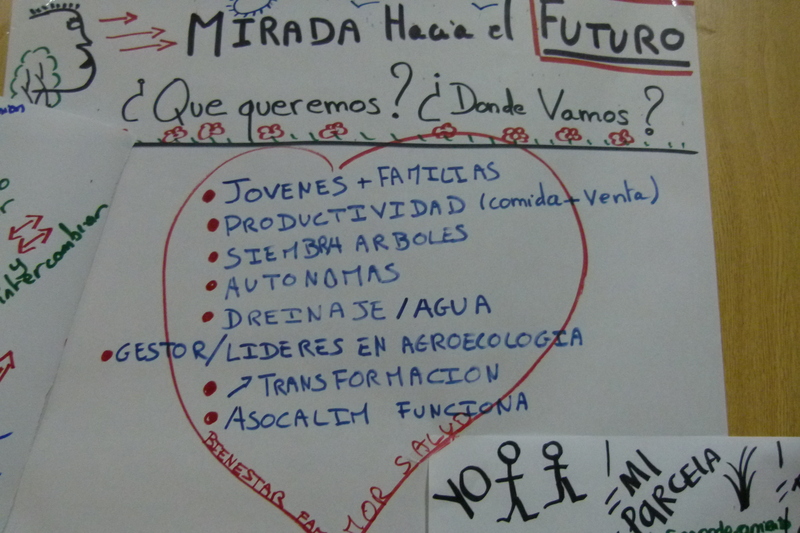 Maria Isabel Victoria, a Colombian trained in social communication and community work, and Magali Villatte, a French graduate in human ecology and sustainable agriculture, will be working together for six months until mid-March 2015 to act as an interface with all the other project stakeholders.